We are in mourning at PSU astronomy. Our colleague Prof. Mercedes Richards died yesterday from complications of a chronic medical condition. Mercedes Richards. Image by Wendy Estep and Sara Brennen. I first met Prof. Richards when I visited Penn State as prospective faculty. The interview was supposed to be about my exoplanet work, but we ended up talking about stars and stellar clusters. After I was hired, it was always a pleasure to stop by her office for her thoughts on stellar activity, stellar evolution, spectroscopy, and teaching. Her home in College Township is just a few doors down from ours, and the Richardses were always warm and welcoming neighbors. Mercedes Tharam Davis was raised in Kingston, Jamaica, where her father, a police detective, and her mother, an accountant, taught her the power of deductive reasoning and care in one’s work. She received her BSc in Physics from the University of the West Indies before moving to Toronto, where she earned her MSc (at York) and PhD (U Toronto) in astronomy. She joined the faculty at the University of Virginia in 1987, and came to Penn State as a full Professor in 2002. 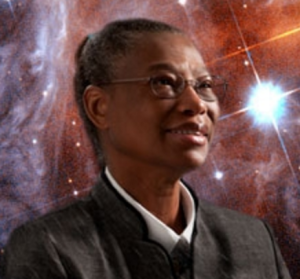 Prof. Richards is especially well known for her pioneering work in tomography of binary star systems and CVs. By strutinizing spectroscopic and photometric time series of stars and compact objects in close orbit, Prof. Richards could create three-dimensional “movies” of mass-exchange systems, answering important questions about how mass transfer occurs. Her research has been recognized with a Fullbright Distinguished Chair, and the Musgrave Medal. The latter has been awarded occasionally by the Institute of Jamaica for over 100 years for achievement in art, science, or literature; Prof. Richards was just the 14th scientist to be so honored. Prof. Richards’s service to the profession is exemplary. She served as President of IAU Commission 42, a Councillor of the AAS, and organized numerous international conferences. She served as our assistant department head from 2003-2008. Prof. Richards’s dedication to students of all ages is well known. Her introductory astronomy class was one of the most popular on campus. She was a founder and director of SEECoS, a high school science outreach program of Penn State, and a Harlow Shapely Lecturer for the AAS. I’m going to miss Dr. Richards; she has served as a role model educator, researcher, and scientist for me since my arrival. Prof. Richards is survived by her husband Donald, who is a professor of statistics at Penn State and occasional co-author with her, and two daughters, Chandra and Suzanne. They have always been joyful presences at department events, and our hearts and thoughts are with them today. This entry was posted in science, Uncategorized and tagged science on February 4, 2016 by jtw13. I knew her well. She will be so missed ! We were students together at York U. and lifelong friends. My thoughts on her family today.RI.P. I was a fellow student of Mercedes at the University of Toronto for a couple of years. She was a true scholar and a wonderful person. My deepest condolences to her family and friends. Damned. Truly shocked to learn again that we all have to go this trail. Thanks for being such a bright and shining yet calm and quit colleague. It was an honour to work with you. Take care up there. Although I did not know Mercedes Richards in a professional capacity, her warmth, care and kindnesses were exceptional, particularly when she worked with children. She was very excited about her work, and could explain what she was doing to those who didn’t have the same sort of training and experience. All of us who met her are better for meeting her. Her example will continue to teach me. I remember Mercedes from graduate school. She was Mercedes Davis when she first arrived. She was a wonderful person who was always happy to see me on the rare occasions when our paths crossed. She left us too soon. We were shocked to hear the sad news. We knew her mainly as a good friend and kind person. Our memories of your visit stay in us forever. We will miss you . We are in deep grief. The Department of Physics,The University of the West Indies, Mona Campus expresses its profound and sincere sympathies to the family, friends and associates of Prof. Mercedes Richards. In this time of sadness, you are not alone. We were very proud of Mercedes’ stellar achievements as she was one of Graduates. Mercedes was my academic “sister” in grad school at the University of Toronto. She was wonderful astronomer and good friend, and she will be missed by all who knew her. I worked with Mercedes as she developed and implemented the SEECOS program with the Upward Bound Math & Science program of which I was the director at the time. Mercedes was an amazing, incredibly caring, committed, compassionate and accomplished woman who touched everyone she met. She was a great mentor and role model to the young, aspiring scientists who came through the SEECOS program and her legacy lives on through them. Heartfelt condolences to her family and friends. She will be sorely, sorely missed. Mercedes was an exemplary mentor. Even though I didn’t work directly with her during my time as a postdoc at Penn State, she provided guidance and understanding. She was always so encouraging of women in science, and always encourages students and postdocs alike to choose the path the works for them – not what others would consider successful. My thoughts and prayers are with her family. I first met Mercedes as a graduate student and I was self-conscious while meeting her but she instantly put me at ease. She was very helpful and inspiring and I was pleased to work with her a on a project. She was so friendly and gracious, and very supportive. I met Mercedes Richards when I invited her to be a Research Unplugged speaker some years ago. It was clear from even a brief meeting that she was an exceptionally kind, engaging, and brilliant person. Her public lecture was wonderful and I know everyone enjoyed being in her presence and learning from her. I’m so very sad to learn that she is gone too soon, and I extend my sympathies to her family and her colleagues. I had the honor of taking an Observational Astronomy course and supporting her Algol research at the University of Virginia. She was always positive force that lifted those around her. She will be missed. I knew something serious was up when she pulled out of our grant proposals late last fall. I feared for the worst. I hope she is in a better place. I will miss her. I’ve known Mercedes since she came to Penn State. She and Donald became members of the HUB lunch bunch and for years we would meet most days for lunch and collectively solve the problems of the world. Mercedes was one of the most compassionate, caring and concerned people that I have ever met. She also was one of the hardest working women have ever known. Despite pain and fatigue for many years she never complained but worked harder. She fought sexist, racist and stupid attitudes that while hurtful never pulled her down. I worked with her on many committees when I worked in Science and the bottom line was that she cared about students, really cared and even though she was a distinguished professor she liked to teach the intro class to non majors because she was excited about her field,. I will miss her and no words can fill that void. Mercedes was very special and exceptional person. I am lucky to be her postdoc at PennState during 2003-2006 and a collaborator. She introduced me and others to the field of Algols, interacting binaries, and Doppler tomography. and revealing discs, streams, and all sorts of accretion structures in interacting binaries. She was indeed exceptional teacher and also organizer. “From Interacting Binaries to Exoplanets” putting together both communities. Mercedes, we will miss you very much. R.I.P. I personally met her once in 2012 in GA in Beijing, but mainly knew her works. Eternal memory! This is very saddening to hear. She was a great scientist and I wish I had known her better. The universe has become a little bit dimmer to my human eyes. I’m so very sad to hear this. She was such a kind warm soul. I would welcome the opportunity to contribute to a scholarship fund in her name. My heart has ached ever since I have heard the new about Mercedes. She was an amazing professor, bright researcher and a caring and gentle human being..I’ve known her for many years and she will be greatly missed by so many, Heaven shines a little brighter as it sure has gained a bright star,,Words fail me at this time and it is hard to fathom this loss. Mercedes was my undergraduate research advisor and mentor when she was at UVa. She was terrific. She included me on papers, took me to conferences, supported me with summer work, and treated me like family. My thoughts and prayers are with Don and the girls. I will miss her very very much. Dr. Richards was a great astronomer. I always enjoyed the research questioned she asked. Even more, she was a great person. She was a rock star of pastoral care and empathy for any student in need. The world was truly a better place with her here. Surprised and saddened to hear this. I am very sad to hear the news, I did not have the chance to work directly with Mercedes but we often talked each other during my graduate years at PSU. She was always very kind and supportive, and I am really sorry to have not been able to see her again after I graduated. She was an example not only as a professor but also as a human being. She will be for a long time in my thoughts. She was a very nice lady and a fine stellar astronomer. I am so sad and shocked to hear this. Mercedes has been a very kind and friendly neighbor. I am thinking of her sweet family today. Thank you for writing, Jason. I’m incredibly sorry and sad to hear this. Mercedes was my advisor on a project in grad school looking at H-alpha observations to infer accretion structure in Algol-type binaries. She showed me how to reduce the data, analyze and model line profiles, and put together an AAS poster, a talk, a paper. I came into grad school burnt out after undergrad but working with her made me excited about doing astronomy research. Later when I had my first job as visiting faculty, she helped me supervise a senior thesis, which meant a lot to both me and my student. She was a wonderful mentor to me and so many others. She was also so supportive of me and my wife and our children. In addition to her stellar research accomplishments, she was an exceptional teacher. Mercedes will be greatly missed. Thoughts and prayers for her family. That’s a great idea. Will you bring it up with Don Schneider? Jason– any thoughts on setting up a scholarship in Dr. Richards’ name? She’s inspired countless students throughout the years, and was truly a fantastic person. Happy to work with you on that and aid in contacting alumni. I am deeply shocked and saddened by the passing of Mercedes Richards. I worked closely with her when she was doing her Ph.D. thesis on Algol at the University of Toronto in 1981-86. It was a long and difficult process, which she completed with a brilliant defense, setting her on an outstanding career. Whenever I met her afterwards, I had the full sense of her as a very warm family person, almost always in the company of her husband or children, and who played an exemplary role as professor and active member of the astronomical community. As President of IAU Commission 42 and now as a Councilor of the AAS, she was a true leader, and we are left much the poorer with her departure. She left us much, much too soon, and I pass on my most heartfelt condolences to her family. I knew her well, many years ago, when she did her PhD here at the University of Toronto, and she was recently profiled in our alumni magazine. She was an excellent astronomer, teacher, and person. She will be missed by all of us who knew her.